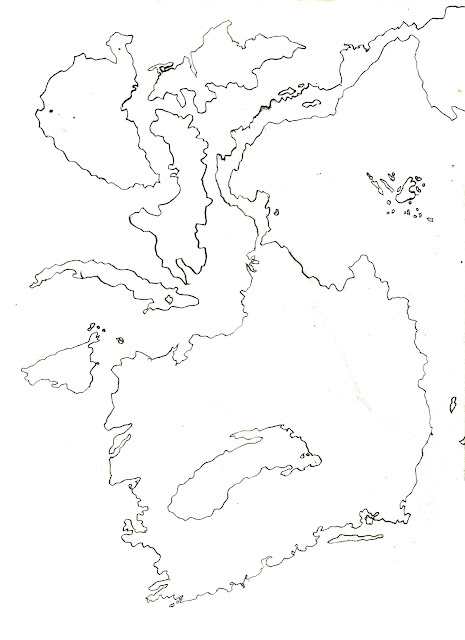 A story: so my son Dave, ten years old, is talented as hell and politically engaged, and he draws maps. He's really good at it. I asked him to draw me a map. I said, two continents joined by a land bridge, five big islands. The rest, all yours. So he drew me a beautiful map. He's the reason Mentis is an island rather than, as I originally imagined, coastal. 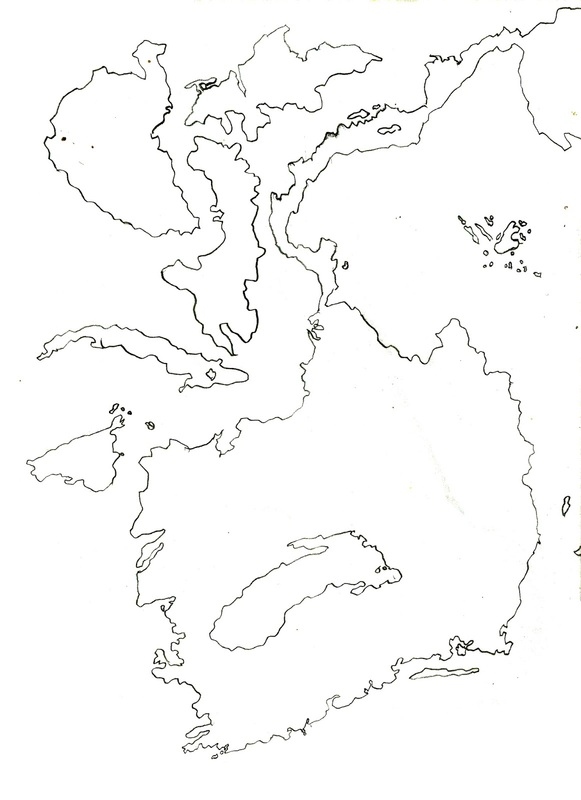 And he drew me an inland sea. And it's thanks to him that I put this story to one of the Atlantea cities I had names for. This one I wrote for Dave, passionate for Wales and its hopes for independence, for the Welsh language, and for justice. I'm proud of that kid. You come to Numea to be forgotten. The Inland Sea, once home to the prolific fisheries of the South, joined to the ocean by the Great Salt River, is dying, and with it Numea, the Fishers' City. The fish, depleted by the aggressive nets of the Numeans, fill the nets, and the level of the sea recedes every year. Numea once stood on an island; now it butts into the coast; now the salt flats, white and dead, stretch out flat towards the north and west, discouraging visitors from the other lands. The brightly caparisoned caravans that once travelled to Chalidocean and Kudra, Caiphul and Keriophis, laden with pickled shellfish, pungent rotted fish sauce, smoked flatfish, pastes and dried tails and tentacles and every other marine delicacy, are few now, the beasts old, the pickings bare and lower in quality than rich Atlanteans remember from their childhoods. The sky-chariots don't come to Numea. The Black Sun nominally commands Numea's loyalty, but Chalidocean hasn't cared for Numea for a long time and the Numeans, among them their large and poor Tlavatli community, return the favour. Everything here is run-down, old; the last time a new building rose it was twenty years ago, and from the patches on the awnings in the Great Fish Market to the chipped and faded grandeur of the Princess Royal's Residency, the city bears the marks of age, not neglected but never renewed, patched up and repaired but never rebuilt. Her Highness Xeleni the Princess Royal, Xeleni the Hand that Wields the Harpoon, has outlived nineteen consort husbands and innumerable bound concubines, but she has never conceived an heir. And while she rules Numea with a hand no less strict than she has for a hundred and ninety years, she cannot last forever. The white paint that cakes her face flakes off like the paint on the faces of the statues in her palace, like the gilding on the woodwork that disintegrates a little more each year, and the courtiers who attend on her begin to jockey for position, impatient to find out which of them will be the one to take her place when one day she grows tired and dies. As the waters on the western coast have receded, the remains of long-forgotten settlements have risen from the waters, narrow skeletal ruins, bleached white with caked salt and barnacle, the drowned corpse of something that was once magnificent. The pointed monoliths and roofless windowed dwellings carry the faint salt-caked remnants of engravings and frescoes from the ancient era and the Princess Royal's Antiquarian has declared that these are the dwellings of the first Atlanteans to live here, to found this place. The Tlavatlis know different. You can see buildings like this on the Five Islands, and the faint traces of hieroglyphs make words in a language more like theirs than the Atlanteans. This was a Tlavatli city once. The Tlavatlis who make up the majority of the poorest stratum of the population, disenfranchised and enslaved, have begun to realise that the stories they always told about how they were here first, that this land and this sea were stolen, might have been true. And as the ones first to starve on the way to the city's slow death, they have the least to lose. Numea isn't much, but even a place like this matters when you have a claim to it. They meet even now in the salt-white ruins and begin to talk of rebellion. Acts of vandalism and the occasional act of violence will soon become something larger, and while neither the Five Islands nor Chalidocean really care about this place, this, thanks to a set of ruins on a newly dried salt flat, could be the place it starts.